Perhaps my expectations were too high, but The Rome at 114 S. Ninth St. was entirely adequate. I decided to try this local Italian restaurant because it is a short walk from campus, and I wanted to support a local business. Second-generation Italians Dan Colace and Cory Hodapp opened The Rome to make affordable Italian cuisine with fresh ingredients, according to the restaurant’s website. They succeeded -- many of the entrees are less expensive than Olive Garden. The most expensive item on the menu is an appetizer called the Rome Platter at $19.95. Veal and steak entrees cost more than the chicken and vegetarian ones. However, you could possibly have a meal cost under $10, if you chose a sandwich, Stromboli, pizza or calzone. The wide variety of options made it difficult for me to choose one dish.The menu includes pizza, sandwiches (including calzones and strombolis) and 33 pasta entrees. The waitress suggested the Baked Penne Salsicce, Penne Pesto and Homemade Baked Five Cheese Macaroni. I decided to have the Salsicce with Bruschetta for an appetizer. My date had the Baked Eggplant Parmagiana, and we shared the Devil’s Tower Cheesecake for dessert. After you order, you get a basket of bread, and I had time to examine the rest of the restaurant. The inside of The Rome is spacious, with high ceilings, large tables and a wall devoted to sports posters and memorabilia. The table width actually made it hard to share the dessert, as I had to lean across the table to reach and eat it. I saw several large groups, and I think that would be the best way to experience The Rome. The atmosphere was not cozy enough for a date, yet it wasn’t formal either. I loved the way the bar looked, though. It had a brick wall and a metal sign that said “The Rome.” It looked like an ideal Italian kitchen, and I wish the rest of the restaurant looked that way. The noise level was a little loud. I talked in a normal voice for most of the dinner, and none of the other diners seemed bothered. I could hear some of what people on the other side of the restaurant said. However, it wasn’t too annoying. The food was, like the waitress said, “good.” I think it was fine, but it could have been better. The menu described the Baked Penne Salsicce as “Penne tossed in a Creamy Tomato Alfredo with Scallions and a Sweet Homemade Crumbled Sausage Baked with Fresh Mozzarella.” My date described it as “a gourmet version of Easy Mac.” I liked the sausage. It was a little spicy and flavorful, but the sauce was too bland. I added some pepper but still wished there had been some tomatoes or grated Parmesan cheese to spice it up. My date liked the Eggplant Parmagiana but thought the breading wasn’t quite crispy enough. I think the highlight of the night was the pesto on the Bruschetta. It tasted homemade and was very fresh.The cheesecake was more cake-y than creamy, but the chocolate and walnut topping was very good. I ended up just eating that by itself. 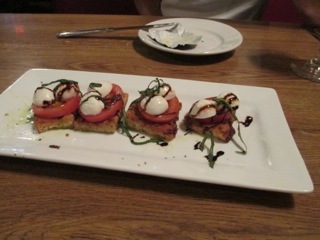 The Rome is good Italian food for a college student who doesn’t have much cash or a car. However, you do get what you pay for. The food doesn’t stand out, and there are better Italian restaurants, like Olive Garden, a short drive away. This review is a part of Jennifer's weekly column where she dines and reviews some of CoMo's favorite restaurants. As someone who is extremely picky about Italian food (due to the fact that Italian dominates my heritage makeup. We frown upon places like Olive Garden because they can barely be called Italian food), I found the Rome to be one of the few Italian restaurants that I like. It even passed my meatball test!